Often rhinoplasty requires adding to the nasal structures rather than taking away explains Sydney cosmetic plastic surgeon Dr. Darryl Hodgkinson. Whenever the nose needs structure added, it requires either a bone or cartilage graft or an implant. 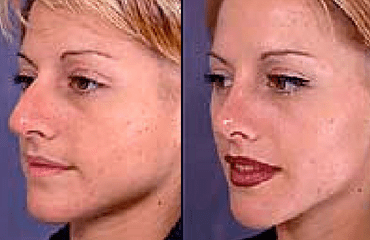 There are many reasons a person may want their nose to be “built-up”. These include congenital deformities, which may result in an uneven nose, a nose broken through trauma that may require more support to the bony structures, people from Asian descent who may want a stronger bridge all patients who have a sixties “over-operated on nose”. So What Does The Surgery Entail? If cartilage is needed it is usually taken from the septum (cartilage dividing the nostrils) or behind the ear. This ensures the scars are well hidden. “I usually try to take the cartilage grafts from inside the nose itself, from the septum. When this is not possible, for instance if the septum is twisted or damaged and needs rebuilding, I’ll take the graft from behind the ear,” explains Dr Hodgkinson. Bone grafts may also be necessary and these are usually taken from the elbow. Taking the grafts doesn’t require more than 15 minutes surgical time and once harvested they can be crafted into the appropriate size and shape. “This way they won’t show under the skin and they will become an accepted and living part of the face,” says Dr Hodgkinson.